John Newton, a slave trader wrote the beautiful hymn “Amazing Grace” many decades after he withdrew from seafaring and slave trading, and became a minister of God. 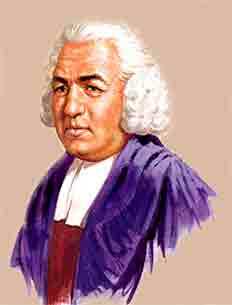 Born in Wapping, London, in 1725, to a shipmaster in the Mediterranean service, and Elizabeth Newton, a Nonconformist Christian, John Newton went to sea with his father at the of age eleven. He sailed six voyages with his father who retired in 1742. Though his father had plans for him to work in a sugar plantation in Jamaica, he signed on with a merchant ship sailing to the Mediterranean Sea. A year after his father’s retirement while on the way to visit some friends, the Royal Navy captured Newton and pressed him into naval service as a midshipman aboard HMS Harwich. Once when he attempted to desert he got punished in front of the crew. He received a flogging of one dozen lashes and was reduced to the rank of a common seaman. Thoroughly humiliated, Newton thought of committing suicide. After he recuperated physically and mentally he managed to get himself transferred from HMS Harwich to Pegasus, a slave ship bound for West Africa. The crew of Pegasus considered Newton a problem. They handed him to Amos Clowe, a slave dealer in West Africa. Clowe gave him to his wife Princess Peye, an African duchess who abused and mistreated Newton along with her other slaves. Early in 1748, a sea captain rescued Newton at the behest of his father who had been searching for him. He sailed back to England aboard the merchant ship Greyhound. The ship almost sank on encountering a severe storm off the coast of Donegal. Newton woke in the middle of the night and prayed to God as the ship started filling with water. The cargo of beeswax and Dyer’s wood drifted inside the inundated ship and plugged the gaping hole, and the ship drifted to safety. This experience marked the beginnings of his conversion to Christianity. As he headed home, Newton read the Bible and other religious literature. By the time he reached Britain, he had accepted the doctrines of evangelical Christianity. From that point on, although he continued to work in the slave trade, he avoided profanity, gambling, and drinking and showed sympathy for the slaves. In Liverpool, he obtained a position as first mate aboard the slave ship Brownlow bound for the West Indies. While sick with a fever, he professed his full belief in Christ and asked God to take control of his destiny. This happened to be his true conversion, and the turning point in his spiritual life. For the first time, he felt totally at peace with God. Even so, he did not renounce the slave trade until later in his life. After returning to England in 1750, he went on three more voyages as captain of the slave-trading ships “Duke of Argyle” in 1750, and the “African” between 1752–1753, and 1753–1754. He suffered a severe stroke in 1754 and gave up seafaring and slave-trading activities. However, he continued to invest his savings in Joseph Manesty’s slaving operations. In 1755, through the influence of Joseph Manesty he obtained the post of tide surveyor (a form of customs officer) in the Port of Liverpool with the responsibility for searching for contraband and remunerated with half of the confiscated booty. In his spare time, he learned Greek, Hebrew, and Syriac and eventually became an evangelical minister. In 1757, he applied to be ordained as a priest in the Church of England. However, it took more than seven years for his request to be accepted. Frustrated during this period of abeyance of the Church of England, Newton applied to the Methodists, Independents and Presbyterians, and even mailed applications directly to the Bishops of Chester and Lincoln and the Archbishops of Canterbury and York. On 29th April 1764, Newton received deacon’s orders and finally became a priest on June 17. Newton after his appointment as the curate of Olney, Buckinghamshire, got sponsored by an evangelical philanthropist, the wealthy Christian merchant John Thornton, who supplemented his stipend of £60 a year with £200 a year. Newton soon became well known for his pastoral care. He won the respect of Anglicans and Nonconformists alike for his beliefs and his friendship with dissenters and evangelical clergy. During his sixteen years of service in Olney, he became so popular for his preaching that the church had a gallery added to accommodate the large numbers that flocked to hear him. The hymn “Faith’s Review and Expectation” later became known by its opening phrase as “Amazing Grace”.